The snapper stands out on the One V Touch, even though it produces less sharp shots than those on the phone’s stablemates. Onboard storage is meagre, but happily can be expanded, and music lovers get the benefit of Beats Audio music enhancement. This handset is neat in size, yet still feels substantial. The chassis is resistant to scuffs and features a lip that makes it look different from other HTC One handsets. Single-core chips can’t always handle Android Ice Cream Sandwich well, but we ran games and apps with no problem. But that single-core processor means the One V Touch is not terribly future proof. The small screen is not really made for surfing the net or watching films, although it is nicely responsive. The keyboard is small but works perfectly. From previous reviews, you’ll know that HTC’s One series – including the One X and the One S, are favourites of ours – we have been impressed with the stylish design combined with amazing power and great features. Now HTC has brought out both the cheapest and smallest of the trio – so can it follow in the footsteps of its big brothers? The HTC One V is definitely the smallest of the One series – it has a display measuring 3.7 inches, compared with the 4.3in and 4.7in screens of the One S and One X respectively. And yet it is quite hefty, weighing in at 115g (that’s nearly the same as the One S). Looks wise there is one big difference – it has a lip that stands out, in a way reminiscent of the HTC Legend. On the front, the glass runs right down to the lip, where you’ll find a trio of touch-sensitive buttons for Recent apps, Back and Home. Hold the One V and you’ll feel it is a solid, premium type of handset – there are no weak spots, no areas that flex. It also has a brushed metal coating that makes it look like its older sibling. This is scuff-proof, which is good news if you’re a tad clumsy. Even with its small display, the keyboard is very usable – we did hit the wrong button from time to time, but the impressive autocorrect facility came to our rescue. It is a very responsive screen, so all your prods, swipes and pokes will register, making it easy to use apps or surf the net. 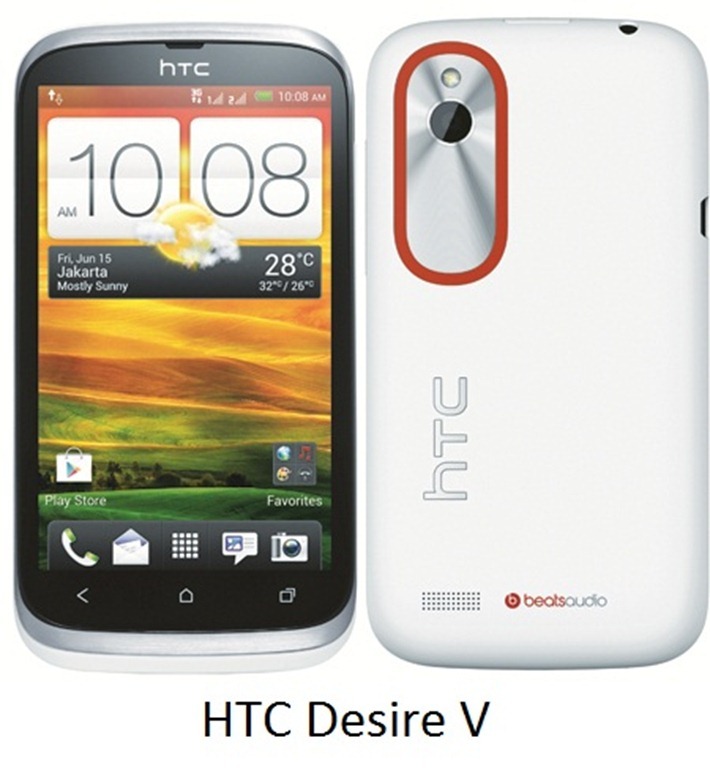 The HTC One V runs on Android’s Ice Cream Sandwich, with the addition of HTC’s Sense 4.0 interface. It’s a nice addition, which offers some great features and looks bright and colourful. You don’t get the number of widgets available on the One S, though, and some of the customisation options have disappeared too. We were disappointed to see HTC had decided to ditch the neat 3D transitions that occur when you switch between desktops. There are still plenty of ways to customise the phone though – you can change skins and scenes – you can even change the four shortcuts that sit at the bottom of the screen. There is a 5-megapixel snapper on board that may not offer the same crisp images as its brothers, but when we viewed snaps close up on a monitor or TV they still offered plenty of sharpness and detail. We had hoped they would be a bit more vibrant, however. Nevertheless, we got some good images when we took pictures in dimly lit rooms, restaurants and pubs. The camera has a 2.0 lens that is capable of letting in a lot of light – but be aware that they will be grainy and you’ll need to hold steady to avoid getting blur. There’s an LED flash that manages to light up subjects without being guilty of too much in the way of overexposure. The camera does offer many of the features found on the other handsets, though. Hold down the shutter, for instance, and it will take a number of quick-fire snaps. It is also possible to take snaps while shooting HD video. Mind you, we weren’t that impressed with the video, which looked faded and seemed to have a grey haze. Running everything is a single-core chip – it’s not as powerful as those on the One S and One X, and it doesn’t take long to realise this. Apps take longer to fire up and sometimes your prod or poke will take a while to register. It’s a pity – even when we were filling in forms online we noticed the lag when entering text and switching fields – and it spoils the user experience somewhat. However, when it comes to apps and games there were no such issues – even some of the latest racing games and fast action titles ran without a hitch. Okay, so some of the very demanding ones suffered from a slower framerate, but they were still fine to play. However, in a year or so you may find that this phone can’t cope with some of the titles coming out – especially as new dual and quad-core Android handsets appear. If you’re a keen gamer you might want to cast your eyes over the One S or One X instead. Strangely, despite the lessened power, battery life is not improved. You’ll get a good 24 hours of heavy use from a full battery, and yet the One X and One X offered more than 36 hours of similar use. To improve battery life, we ended up opting out of Netflix and disabling some features. When it comes to memory, you’re not getting much on-board – a measly 4GB. In fact when we actually checked the memory on our review handset, there was less than 1GB of usable storage to be had – and only 100MB of that could be used for music, films and photos. That means you’ll squeeze on about a CD of music if you’re fortunate. However, it is possible to expand the memory to 32GB using a microSD card. Our online experience was smooth, thanks to the screen being so responsive. Complex sites loaded speedily when we were zooming in and out or scrolling up and down. It is also possible to stream video with apps including BBC iPlayer and Netflix – or indeed you can enable Flash and do this in browser. There were some hiccups when using iPlayer – there were some random flickering lines for instance – and yet Netflix and YouTube were fine. Streaming video proved to be smooth and trouble-free. The display is nice in use – colourful and bright. Movies look good, although the display is a tad small to really enjoy them – movie fans would do better with the other One handsets. Music has the benefit of enhancement from Beats Audio, so all genres sound great – although it’s on music with plenty of bass that you get the best effects. At £250 SIM-free or from only £13.50 per month if you choose a contract, the HTC One V offers plenty for your money. Okay, so Ice Cream Sandwich does not always perform to its best ability with that single-core chip, but the bright display and 5-megapixel snapper and its features are impressive at this price.